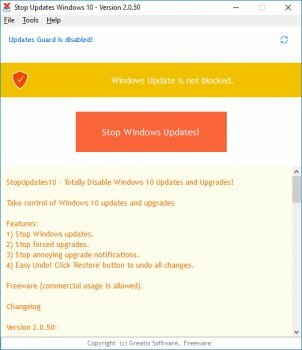 StopUpdates10 is a free utility to stop Windows updates / upgrades. StopUpdates10 gives you a control over Windows updates. Easy and quick undo to the previous state. StopUpdates10 does not delete files and does not change file rights or another destructive actions. It messed up my start menu, locked up my clean Install of Windows, prevented my antivirus from loading while it did a massive transfer of data through my firewall, and the adware....Don't get me started on the adware! Bottom Line: Works as Advertised! Bottom Line: It does stop updates!